Cotroceni is perhaps the most authentic district in Bucharest, an area which - like Bucharest itself - is rediscovering its pre-World War II elegance. The streets are lined with Linden trees and provide welcome respite from the summer heat. To explore Cotroceni is to explore a Bucharest which has all but ceased to exist. Home to Romania’s president, the city’s Botanical Gardens and a mix of architecture as eclectic as you could hope for, from the starkly modernist to Art Deco, cubist to neo-Romanian, many with well-tended gardens and courtyards, Cotroceni is often overlooked by visitors to the Romanian capital. We intend to put that right. Begin the walk at the Romanian National Opera, on the far side of the enormous Piata Eroilor. Any bus heading west from Universitate will get you here: you can also take the metro to Eroilor. The opera was built in the early 1950s, opening in 1954 with a performance of Tchaikovsky’s Queen of Spades (political interests at the time insisting that a Russian composer have the honour). Vaguely neoclassical in design the building is elegant if rather plain - on the outside at least. The interior is a different story. The main auditorium is richly decorated and a superb place to see either opera or ballet (the building hosts both). The season is currently in full-swing, and not without scandal: read about that here. Cross the square and head for the unmistakably Byzantine New St. Elefterie Church, distinctive with its red and white stripes. Construction on the church - designed by Constantin Iotzu - began in 1935, but was not completed until 1971. The impressive wooden altar was carved by Grigore Dumitrescu and Aurel Obreja, while the stunning paintings are the work of Iosif Keber and Vasile Rudeanu. One of the largest churches in the city (it is 36 metres high at its tallest point) the church was built to complement the much smaller yet far more charming Old St. Elefterie Church, which had by the 1930s become too small for the number of people wanting to attend services here. It was at this time that Cotroceni was becoming one of the capital’s smartest districts, after work on consolidating the embankments of the Dambovita river had created a suburban, green area where the city’s wealthy began building homes. Bucharest - indeed Romania as a whole - was at the avant garde of architectural movements throughout the 1920s and 1930s, a fact which explains the extraordinary number of superb buildings found in Cotroceni. Directly opposite the church in fact, at Strada Sf. Elefterie Nos. 6 and 8 are two small apartment blocks which typify the kind of building common in Bucharest at the time. Note the way the central, arched windows protrude into the street: a common feature of a style usually dubbed neo-Romanian. (Note also how the recent modernisation/renovation of number six has rather spoilt the facade). Walking along Strada Elefterie, take a look at how the wall creepers have entirely taken over some of the otherwise elegant houses (a couple of which, you will no doubt remark, were built with smart Italianate loggias on the upper levels). As the road forks, you will see the Old St. Elefterie Church in the middle of the street. Not always open, if you can get inside make certain you do: the interior paintings are stunning. Turn left onto Strada Doctor Jean Clunet (you would have noticed by now that many of Cotroceni’s streets are named after doctors) and you can make a pit stop at the rather pleasant Museum cafe and restaurant, housed inside yet another fantastic building, complete with a gloriously shaded, cooling courtyard terrace. 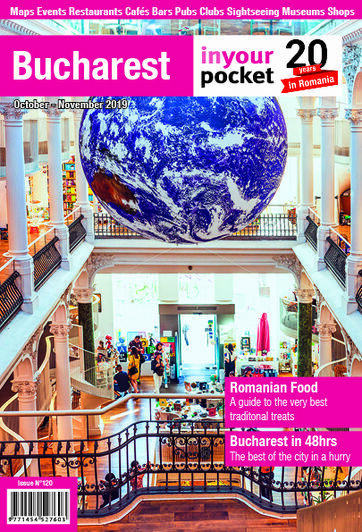 Cotroceni is a little short on places to eat and drink: Museum is one of the best options. Follow the street as it curves around and you will see what could be called the two faces of Bucharest (indeed of Romania). On your right is Piata Cotroceni, an ugly monstrosity built during the communist era when little thought was given to aesthetics, while directly opposite is one of the many Art Deco buildings found in Cotroceni, built in the 1930s when style was everything. The original door remains, as does the distinctive Art Deco window above it. Notice also how the rounded front of the building (built on a corner where the street splits into two) resembles the front of an ocean liner. This was a feature of Art Deco buildings all over Europe, adopted with relish by the architects of Bucharest. It is a shame that this particular building is not in better condition. From the market, head west and cross the wide Bulevardul Eroilor. The modernist building at the far end of Eroilor, looking not wholly unlike an Italian railway station, is the Officer Academy of the Romanian Army. It was built in 1937 to the designs of modernist master Duiliu Marcu, and was one of few places in Bucharest to see real action during World War II: Nazi officers based here put up stiff resistance during the palace coup of August 1944 in which Romania’s pro-Nazi dictator Ion Antonescu was deposed. Follow Strada Doctor Carol Davila until you reach the remarkable University of Pharmacy and Medicine. Completed in 1903 it was designed by the Swiss architect Louis Blanc and while the facade is unmistakably neoclassical, complete with huge Corinthian columns, the rest of the building incorporates a number of styles, including some extravagant Baroque carvings above the enormous arched windows. Directly in front of the main entrance is a large of bronze statue of Carol Davila, a Romanian doctor of Italian origin (for whom the university is named) who in the 1870s developed one of the first treatments for cholera. The ugly high-rise behind the university is Bucharest’s Municipal Hospital. Fully functional it is nevertheless still incomplete more than forty years after construction began. Heading west again, three fine and yet very different neo-Romanian houses all in a row (at Strada Carol Davila 73, and Eroii Sanitari 10 and 12) lead the way towards the main entrance of Cotroceni Palace and Gardens, home, since 1991, of the Romanian president. (Note that should you want to take the tour of the palace - and you should - the visitors’ entrance is on the far right hand side of the palace, a good ten or fifteen minute walk. You will also need ID, and should book a place on the obligatory guided tour a day in advance). The palace was constructed from 1888-93 at the behest of Romania's first king, Carol I. Built on the site of a former monastery (the foundations and cellars of which remain, and form part of the tour), the palace was designed by a French team of architects, led by Paul Gottereau, and would serve as something of a blueprint for Romanian domestic architecture for years to come. It was home to the Romanian royal family until 1939, while during the communist period it was used as a guesthouse for visiting heads of state. 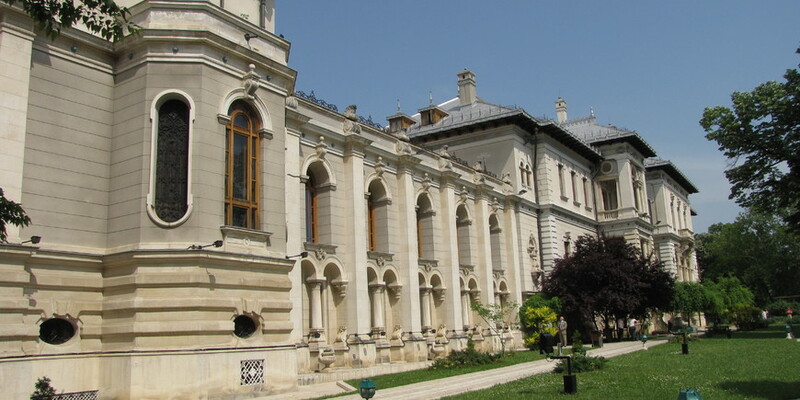 The part of the palace which is today the president's office, and official home, however, was added only after the great Bucharest earthquake of 1977, and bears the stamp of local architect Nicolae Vladescu. Part of the palace is open to the public, and can be visited on a tour. You will see a number of function rooms, many of which were decorated to the whims of Marie, the English wife of Carol's heir, his nephew Crown Prince Ferdinand. You will also be able to view her astonishing art collection. During the construction of the new wing in the 1980s, ruins of the original monastery church were discovered, including part of the original interior frescoes. The church has been partially rebuilt and can be visited without joining the full palace tour.